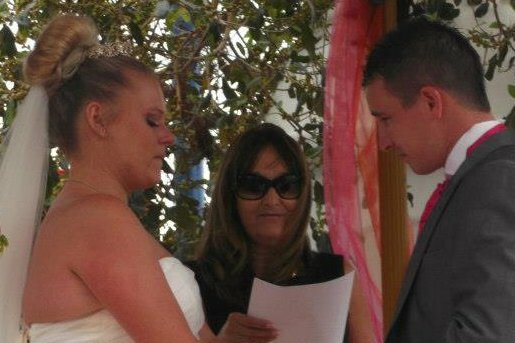 You can read your own vows whilst standing on a beautiful Lanzarote beach, in a luxurious private villa, or hotel grounds or perhaps at sunset on one Lanzarote’s stunning coastlines. “Jackie made sure our wedding day was perfect. Our day exceeded our expectations and was bigger and better than we thought possible in every way. From our first meet we knew we wanted Jackie to marry us. She helped Ginny with her dress, she was with the girls getting ready, she was like a 2nd Mum, without stepping on peoples toes. Jackie was intricate and involved in every aspect of our day. She ensured the day went smoothly, that we kept to time, she was always there but never felt intrusive or ever in the way. Jackie made sure our day was ours throughout. She took care of everything from helping with photos, to pulling faces to make our niece smile, everybody was involved, everybody was happy and we were delighted. “Last year I had the pleasure of meeting Jackie Lee who organized my wedding blessing. It was all organised by email as we are in Scotland, Jackie emailed us various different services to choose from and we also included “The Rose” ceremony after choosing various exerts we liked Jackie then tailored this to our requirements and it was just lovely. It was a small affair at the poolside of our Villa, Jackie helped us with everything she suggested a great photographer and also a lovely restaurant for our wedding dinner, taking a lot of stress away from us. “This is a long overdue Thankyou for the wonderful service you carried out for us. After our registry office wedding in the UK we wanted a romantic personal blessing in Lanzarote with just our close family and friends. We didn’t want a big formal affair we wanted a service personal to us. You helped us achieve our perfect day with your guidance and advice we chose the service the readings and had the day we really wanted. We had 14 close family and friends there and we decorated the pagoda with voile and butterflies and had the service by the pool in the beautiful sunshine.